1929: Launched by John Chambers Ltd, Lowestoft (Yd.No.576) for Lowestoft Steam Herring Drifters Co Ltd, Lowestoft as LORD St. VINCENT. 7.1929: Completed (Harold Jackson, manager). 25.7.1929: Registered at Lowestoft (LT79) and insured for £4,500. 1930s: Seasonal trawling out of Padstow and Fleetwood (Lowestoft Fish Selling Co Ltd, Lowestoft, managing agents). 24.3.1932: At Newlyn with damaged propeller. 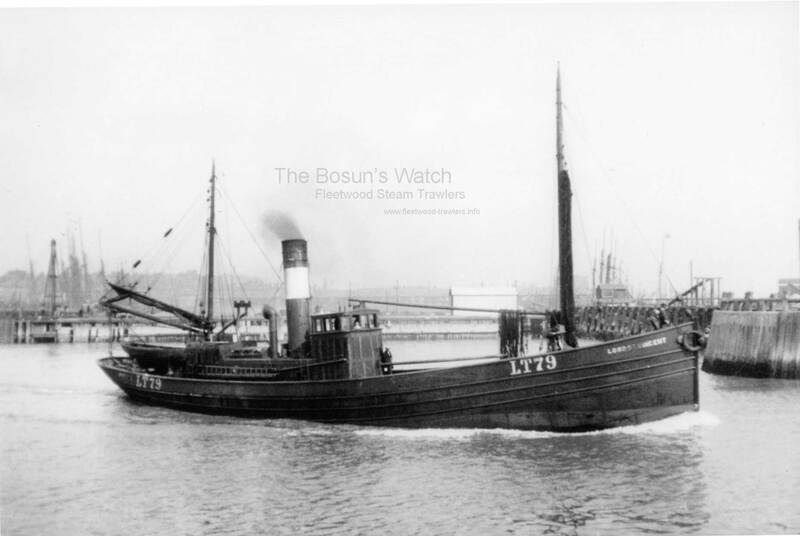 2.10.1933: Disabled off Lowestoft with piston rod failure. LNER tug LOWESTOFT (172grt/1898) connected and delivered Lowestoft. 9.8.1938: Off Milford Haven connected to disabled steam drifter LORD SUFFOLK (LT44) and delivered Milford. 4.9.1939: Requisitioned for war service on contraband control (Hire rate £61.13.4d/month). 28.5.1940: With Senior Officer (Cdr J. S. M. Glendinning RNR retd) in steam tug JAVA (128grt/1905-500ihp) (Capt W. Jones) left Ramsgate for Dunkirk at 3.00pm in company with steam drifters LORD RODNEY (LT390), LORD COLLINGWOOD (LT79) and LORD KEITH (LT181). 29.5.1940: At 4.30am. ferrying troops to ships. 10.00am. alongside Dunkirk Pier embarking troops. 5.00pm. left Dunkirk beaches for Ramsgate. 30.5.1940: At Ramsgate at 7.40am. landed 150 troops. 7.7.1941: Mined off North East Gunfleet Buoy in Thames Estuary (Sk. J. S. Alexander RNR). One casualty – James W. Utting, stoker, killed. 9.7.1941: Robert E. Cullingford, Engineman died of his wounds. 23.7.1941: Lowestoft registry closed “Vessel lost 7.7.41”. 31/12/2010: Page published. 8 updates since then. 06/11/2018: Removed FMHT watermark from image. 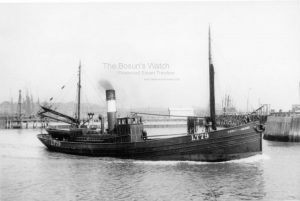 This entry was posted in Drifter/Trawler, Lost Vessels, Seasonal Visitors, Steam Trawlers, Steamers (Picture), War Losses and tagged Drifter/Trawler, Lost, Seasonal Visitors, War Loss on December 31, 2010 by Fred Smith.